SWASTH –Attempt to reach out to 10,000 households of the state. “Sanitation is the biggest blot on the human development portfolio in India. The sanitation situation is disastrous” (India Environmental Portal), quoted by Sri Jairam Ramesh, Former Minister for Rural Development. Only 32% of rural households have their own toilets, according to the reports of survey conducted by NSSO in 2012. An additional 9% have access to toilets although the access figure could be an overestimate. The results of the last census had also highlighted India’s gaping sanitation deficit. Census results showed that less than half of Indian households have a toilet at home; in fact the number of households with mobile exceeded those with a toilet facility at home. The woefully inadequate progress in sanitation makes India an outlier even among developing countries. Of the estimated billion people who defecate in the open, more than half reside in India. Poor sanitation impairs the health of Indians, leading to high rates of malnutrition and productivity losses. India’s sanitation deficit leads to losses worth roughly 6% of India’s gross domestic product (GDP), according to World Bank estimates, by raising the disease burden in the country. Children are affected more than adults. The rampant spread of diseases inhibits children’s ability to absorb nutrients, stunting their growth. 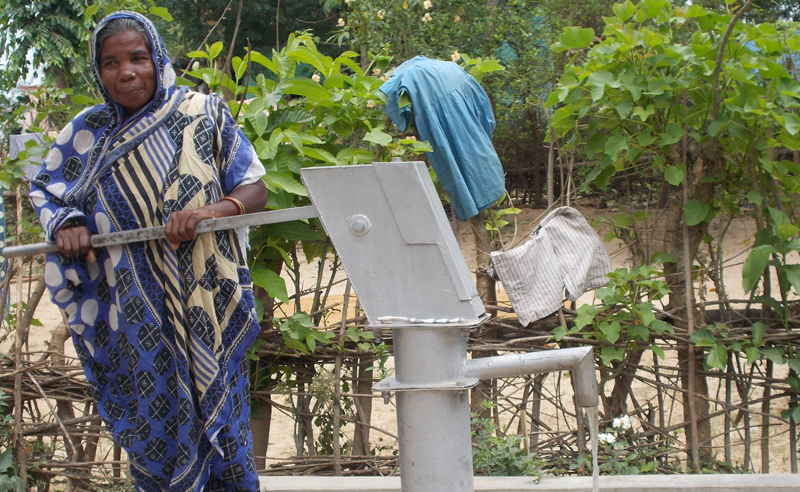 A number of innovative approaches to improve water supply and sanitation have been tested in India, in particular in the early 2000s. These include demand-driven approaches in rural water supply since 1999,community-led total sanitation, a public-private partnerships to improve the continuity of urban water supply in Karnataka, and the use of micro-credits for water supply and sanitation in order to improve access to water and sanitation. People’s Forum initiated its SWASTH project providing micro finance for water supply and sanitation in the year 2014 . The objective of the project was to develop sustainability and accessibility of people to safe water and sanitation thereby ensuring healthy and better standard of life. It aims to reach to approx 3 lakhs beneficiaries/ 60,000 households by the end of 2017. The first component is taken care by the fund provided by water.org and FINISH society, whereas Oiko Credit and AMPL has extended support for providing soft loan support to take forward the social infrastructure development in rural areas pertaining to safe water and sanitation. Water.org is an American Foundation that focuses on developing new technical solutions for water and sanitation infrastructure, financial and marketing model for behavioural change in rural communities. They are working with various Organizations like Grameen Koota, Bandhan Microfinance, GAURDIAN, etc. SHGs are the main gateway into the community for the project personnels. Thorough discussions are held with the members of SHG with regard to the issues of water and sanitation in their area. This is followed by making them aware of the impact poor water and sanitation has on their health and economic life. They are then shared about the loan component of the project and interested members are at liberty to take loan for creating or strengthening infrastructure of water or sanitation facility at their household level. Operating in most financially backward states of Odisha, Chattisgarh, Jharkhand, Madhya Pradesh, Maharastra, Bihar and 90% operation in deep rural areas thereby increasing the impact where microfinance for Water and Sanitation is most needed. 10,000 toilets have been created in the operational areas of the program. Focusing on individual awareness building, capacity building and behavioral change through repeated interaction with clients. Developing sustainable and economic water and sanitation model. Developing new and effective loan model like water purifier loan. Committed Operation and Management Team for tapping available potential and financing. Water and Sanitation training – In this, a training session is organised about SWASTH Loan for Branch staffs. It is two day training programme, first day is a class – room session and second is field visit. The guidelines, technical aspects, loan procedure and product pitching techniques are described and demonstrated in this training session. Client formation activity – Once the branch staffs are trained, he/she conducts a routine activity with their SHG members and generate new lead. The activity consists of discussion on various issues of sanitation and water, benefits of household water and sanitation facilities, sensitization about safety, convenience and their privacy etc. Help of IEC material is taken for the purpose. And any if client requires financial support then SWASTH loan products are suggested. Mason Training – Annapurna has a unique design of sustainable and economic Water and Sanitation facility at household. This design is demonstrated to the local masons in villages. A workshop of 3 days is organised consisting of 15 to 20 masons. Two teams are made out of this strength and two needy household are selected to construct the sanitation facility at their premise. These toilets are constructed as per Annapurna design by the two teams of masons. In this period one number of training programs was organized. Awareness creation – Various awareness activities such as campaign, health camps and community workshops are organised on occasions like World Health Day, World Toilet Day, World Water Day and Local Rural Fests at field as well as branches. The rallies of school students are organised at various villages. Sarpanch, B.D.O., Anganwadi workers, B.E.O., Mukhiya etc. are invited at such events and issues at grass root level are discussed openly. Solar Energy for the Non-Electrified & Inadequate Electrified areas of the state. The world must turn to (the) sun to power our future. As the developing world lifts billions of people into prosperity, our hope for a sustainable planet rests on a bold, global initiative. - Onno Ruhl, World Bank Country Director in India. The National Institute of Solar Energy in India has determined the country’s solar power potential at about 750 GW, a recently released document by the Ministry of New & Renewable Energy (MNRE) shows. The solar power potential has been estimated using the wasteland availability data in every state and jurisdiction of India. The estimate is based on the assumption that only 3% of the total wasteland available in a state is used for development of solar power projects. India’s current solar power installed capacity is around 3 GW, or less than 0.5% of the estimated potential. Therefore, there exists a massive opportunity to tap this potential. As a result, the Indian government has increased its solar power capacity addition target five-fold. Instead of the initial target to installed 22 GW solar power capacity by 2022, the government now plans to add 100 GW capacity. This includes 20 GW of ultra mega solar power projects, with installed capacity of 500 MW or more, across 12 states. People’s Forum now plans to venture into the field of solar energy with the objective of supporting rural electrification initiative. The modalities of the program are in the process of development. HIG-97, Dharmavihar, Khandagiri, Bhubaneswar - 751030. City / State Khandigiri, 18/1185, Odisha. © 2016 People’s Forum. All Rights Reserved.